– By typical definition of “Province”, came the idea of taking you away from the hectic capital city, traffic jam, raucous streets, busy life and work pressure to a smaller area situated away from the population center. – We were mainly inspired by “La Provence” situated in the South East coast of France which extends from the left bank of the lower Rhône River on the west to the Italian border on the east, and is bordered by the Alps on the northland of the Mediterranean Sea on the south. While some of the emblematic icons of Provence – the lavender fields or the Mont Saint Vincent so often painted by Cézanne – are or seem specifically aftached to this region, others including the olive trees, the dry rocky coastline with its scented stunted pine trees, the evening air filled with the chi-chi-chi of a thousand crickets, and even the villages and vineyards, are actually features that characterize large stretches of the Mediterranean coast and its hinterland. – One of the similarities derived from the choice is the climate as we share the same Mediterranean weather. Summer is dry, warm, with sunny blue skies, in the winter, temperatures are frequently hover or just above zero, and though snow is not common, a cold winter Mistral can send temperatures down to several degrees below freezing. – We have come to realize that for our clients in order to actually feel a unique living experience, we must place all the elements that will make you feel, smell, hear, and see. We have focused that in each project we will bring you that feel and emphasize on a certain sense if not all. Indulge all your senses in a province that is everyway gateway from the fast-paced life of the city. – Indulge all your senses in a province that is everyway gateway from the fast-paced life of the city. 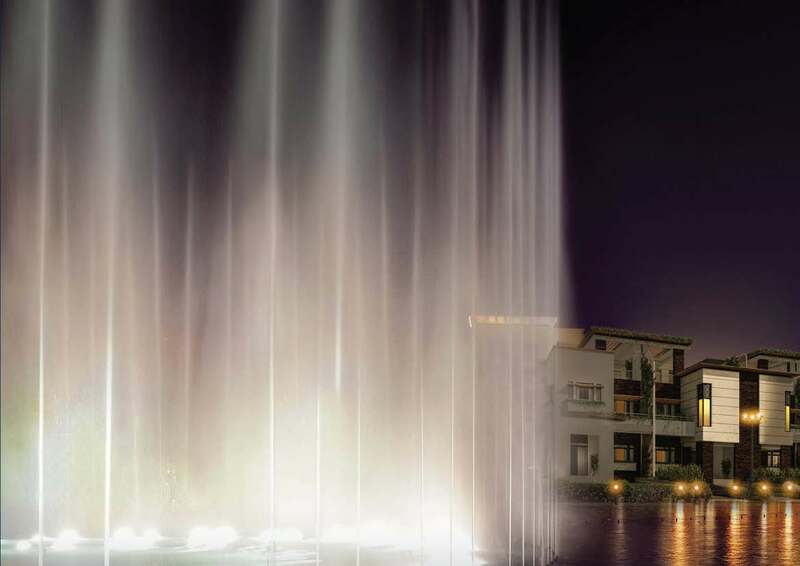 – Imagine waking up every day on the beautifully outstanding designed landscape and state of the art fountain, waterfalls, and different water features. – Natural, sustainable components: Contemporary architects recognize the human need for contact with nature, right down to what our homes are made of. Hence the popularity of bamboo floors, granite countertops and even “living” roofs made of green plants. – Recycled and nontoxic materials: Countertops, roofing and flooring made of composite materials are hot, as are low-emission paints and carpeting. – Natural light: Today’s houses often feature ample skylights and large windows to let the sun shine in. What makes La Fontaine Province a Prime Location? – Surrounded by the exceptional landmarks of New Cairo as it’s situated in the club’s area behind the American University in Cairo and with proximity to the new capital Cairo… La Fontaine Province is definitely the prime location you’re looking for. – The one to one concept is balancing the ratio of greenery viewed by each unit while maintaining its privacy as well: La Fontaine province has devised this concept where each unit will be viewing the exact amount of greenery and fountains whilst maintaining each unit’s privacy. – La Fontaine Province provides you with privacy and the guaranteed opportunity to get whisked away in the beautiful sounds of nature, the exceptional scenery and the province experience that indulges all your senses. La Fontaine City Stars Compound New Cairo Arco province aim to provide you with the unique experience and the luxury of enjoying pools, all year round we have pools that cover your swimming craving while maintaining your privacy. Covered and heated swimming pools are available to all units in the province. Whether you are an outdoor swimmer or you prefer indoor during the cold weather you will get to enjoy the luxury of swimming pools as a part of the province experience. Botanical gardens offer the city dweller part of the natural environment. that he no longer has access to furthermore, they offer a mental’ escape. from population pressure and suggest new interests and hobbies having to do with the natural world. A major contemporary objective of botanical gardens is to maintain extensive collections of plants, labeled with common and scientific names and regions of origin. Refuse chutes have long been recognized as the most convenient method of handling waste. Cafes, Restaurants and a bunch of other recreational services will help you unwind on normal days and enjoy your weekend. Enjoy a sunny day grilling in our specialty BBQ serviced area. A safe filled area for your kids to play and have fun. If you have some errands to run, it will be the safest place to leave your kids in as in home. Enjoy every moment of your time while your kids are safe and sound. In La Fontaine we aim to bring family together. Spending quality time fogether is one of the most important things in life. We are planning to induce more ideas to make the whole province your home not just a unit in a fenced community. We have designed an exclusive all around the province track for bicycles, and other athletic activities. Enjoy the great weather by doing your favorite sport in La Fontaine Province.